In AI Suite, business configurations are defined at design time and depend on the customer needs. Designer: defines new attributes of the configuration structure for defining editors, dictionaries, report templates, exits, and other AI Suite settings like importers and data lifecycle. Define structure and rules: In Composer, the user defines the data structure (business events) and the different business rules (transformation, aggregation and audit). Send configuration files to Repository (mvt and ctx): From Composer, the Rule Engine configuration is sent to Repository using Administration. The configuration is then stored as AI Suite configuration in the Repository database. The mvt and the ctx configuration files use a custom fixed flat format. 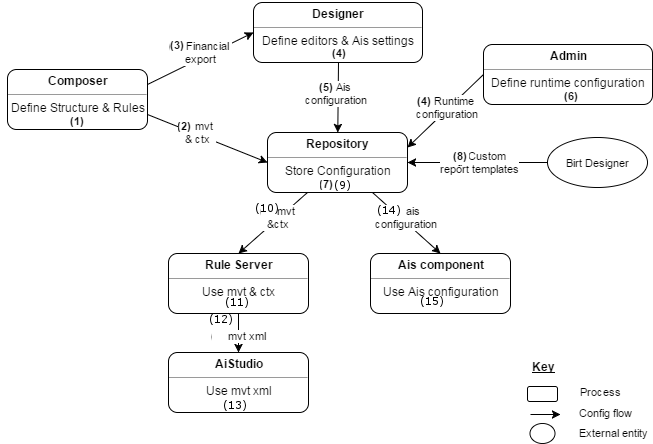 Export financial XML file: From Composer, the user exports an XML Financial Export file that defines the formats used in the Rule Engine. This file is sent to Designer that transforms and loads this configuration as Designer configuration formats. Define editors and AI Suite settings: In Designer, the formats are enriched with different attributes such as spaces, tags, lifecycle configuration, and exits. In addition to the data structure configuration, Designer is used to configure many aspects of AI Suite: editors, dictionaries, exits, event processor rules (data flow rules), importers and different global settings. Publish configuration to Repository: From Designer, the configuration (formats, editors, dictionaries, etc.) is published to Repository. Report templates are sent to Repository through Report Server. These configuration files are mainly in XML format. Define the runtime configuration: The runtime configuration (Event Processor listeners) is defined in Administration. Store the runtime configuration: The runtime configuration (Event Processor listeners) is stored as XML configuration in the Repository database. Define custom report templates: Custom report templates are defined using the BIRT Designer. These custom report templates are imported in Repository using repository command tools to be used by the AI Suite components. Store the runtime configuration: The Repository API is used to store the runtime configuration and to provide access to it to different components. Send the configuration to Rule Engine Server (mvt and ctx): The AccountingIntegrator configuration is read from Repository and used by Rule Engine Server. Use the AccountingIntegrator configuration (mvt and ctx): Rule Engine Server uses mvt & ctx configuration files to process input financial events. Rule Engine Server uses embedded Rule Engine runtimes to perform processing jobs. A Rule Engine runtime is also able to regenerate its configuration into an mvt.xml file containing structure, rules and labels. Send the mvt.xml configuration file to AI Suite Studio: Using a command scrip, the user sends the mvt.xml configuration file produced by Rule Engine and embedded in Rule Engine Server to AI Suite. Use the mvt.xml configuration: AI Suite Studio imports the mvt.xml configuration file provided by Rule Engine and transforms it into documentation. Use the AI Suite configuration: Components InterPlay, Datastore or AI Suite Studio) use the configuration from Repository to perform specific operations. Some of the configuration is used by all components (formats) while other configuration is used only by one component (for example, only InterPlayuses editors). Multiple configuration sets (grouped in application) can be stored in Repository and a component can use one or several configuration sets.